After studying the history of Alaska, my students focused on the culture of Alaska. Alaska is full of unique and interesting cultures. There are many native Alaskans that have participated and still participate in the Iditarod each year. 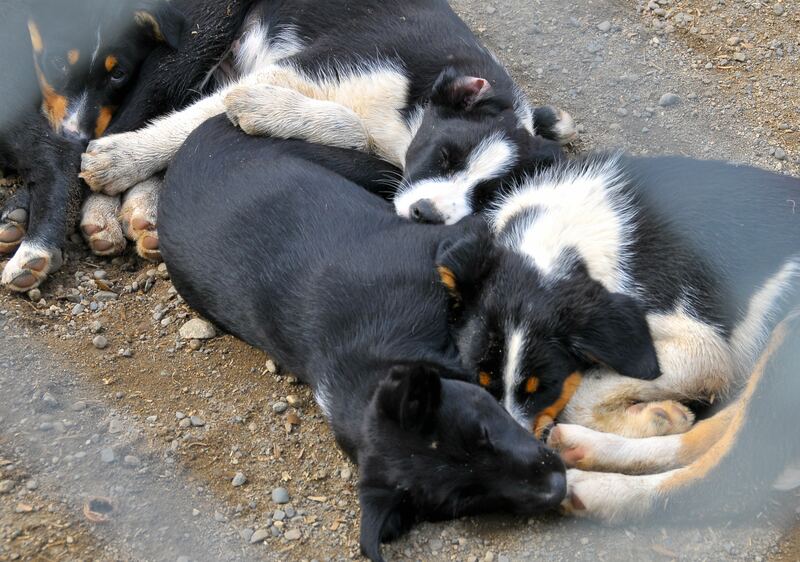 The Iditarod and sled dogs are a big part of Alaska’s culture. The students in my class recently created a virtual museum showcasing the different cultures of Alaska. Their project began with researching the different cultures and choosing four they would like to learn additional information about. After gathering information, the students had to choose which items they would like to display as exhibits in their museum. Each group received a template of the virtual museum in their Google Drive folder. They immediately shared the museum with each member of the group. Now, students were able to work on the museum at the exact same time while anywhere. Students were also able to message each other while working on the museum, an excellent Google Drive feature. Essentially, the virtual museum is a Google Slides presentation, an enhanced presentation. The first page of the slideshow makes you feel like you are looking into the lobby of a museum. There are arrows directing visitors to certain rooms in the museum. When the viewer clicks on one of the arrows or rooms, it changes the screen to the specific room. When the viewer is in the room, they will see the inside of a room in a museum. While in this room the viewer will have the option to click on an exhibit. After clicking on the exhibit, the presentation will direct the viewer farther in the room to read about the exhibit and view an image or video. In each room viewers will have the option to return to the Museum Lobby or the room they came from. I required each group to include four rooms in their museum. Within each museum they had to include two or three exhibits. Farther in the exhibit room is where the students included a detailed description and an image or video showcasing their featured item. The template provided to the students is very easy to work with. All students have to do is replace their information in the boxes. If you would like to use the student sample presentation template, click File and scroll down to Make a Copy. It is now yours to do with what you want. Click here to view the student sample Virtual Museum. To begin your tour of the museum click Present in the top right of the screen. Once you are in the lobby, click a room to get started. Enjoy your tour. Alaska has a rich history, starting when it was settled by the Russians to the beginning of the Iditarod sled dog race. My students just finished studying the history of Alaska. After class discussion and additional research the students were assigned to create an interactive timeline. We used a new, free learning tool called HSTRY. It is a free tool for teachers and students to use to create timelines. The timeline is set up very similar to a Facebook profile. When entering an event to the timeline students are able to choose to enter the event as an image, a “Did You Know” fact, a quiz question, a YouTube link, an audio clip, or just text. The activity started with a class discussion about what the students already know about the history of Alaska. We listed on the board several events; when Alaska became a state, the capital, when the Iditarod started, and the gold rush. The students then turned their attention with their small groups on researching the many events in Alaska’s history. When researching, the groups had required information for their timeline as well as finding events in history which were interesting to them. This ensured all groups not having the exact same timeline when finished. In order to begin creating their timeline, students had to join the class I created on the HSTRY website. This was very easy to do; students came up with a username and password, and entered a code to enter the classroom. They were now in the classroom and free to begin creating their timeline. When the timeline is finished, they will publish their timeline and I will be able to access it very easily through my account. When all the timelines were finished the students had the opportunity to view another group’s timeline. While they viewed the other timelines, they were to focus on the writing assignment they received; What event in history do you feel has impacted Alaska the most. Defend your response with factual evidence. After viewing other timelines and completing the writing assignment we came back as a whole class. We discussed the events the students felt had the biggest impact on Alaska. We also discussed the many events of Alaska’s history. This technology tool is a new and interesting way to create and share timelines. Teachers are able to create their own timelines to share with class as well. To view a finished Alaska HSTRY timeline, click here. You will need to register to view the timeline. It is free. We took a break in Rohn in our last Checkpoint Checkup. It’s time for our mushers to get moving again. This section of our journey is approximately 75-80 miles and will take about 10-15 hours. This part of the trail can be broken down into three sections; Rohn to the Farewell Burn, across the Burn to Sullivan Creek, and then Sullivan Creek to Nikolai. Since this is such a long run, some teams will give their dogs a long break along the way and others will take several shorter breaks. Mushers can look forward to some beautiful scenery along the way, but some challenges will arise also. First, teams must contend with some harsh winds. As mushers are traveling along the Kuskokwim River, they will meet winds in excess of 40 mph, usually head on. This part of the trail also includes sections of glare ice. Glare ice is ice that has a very smooth, glass-like surface. Egypt Mountain from the sky. Eventually, the dogs and mushers will run through the Buffalo Chutes. Since being moved from Canada in 1965, hundreds of bison roam this area. 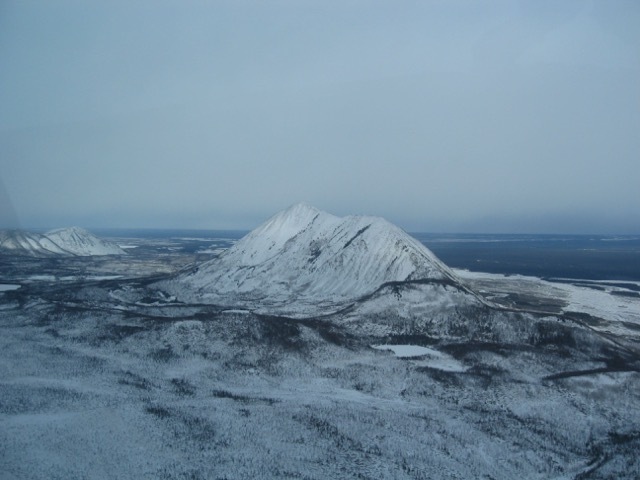 It is on this part of the trail mushers will see Egypt Mountain which is approximately 3000 feet high. Once past Egypt Mountain, mushers will run into a difficult section of overflow. Overflow occurs when the ice gets so thick that the water has nowhere to go and pushes up over the ice. Overflow can be very challenging to cross. Mushers will soon be at Farewell Lake. After about five miles they will head past the Old Pioneer Roadhouse. According to Don Bower’s trail notes, this is an original stop on the old Iditarod. He also notes that you can still see ruins of a couple of cabins there. Mushers are now in the second major section of their journey to Nikolai, the Farewell Burn. The Farewell Burn is the location of one of the largest forest fires in Alaska history. In 1978, a forest fire destroyed about one million and a half acres of forest. Mushers will be traveling through this land for about 40 miles. Initially, after the fire, this part of the trail was very difficult due to all the burned trees and limbs blocking the trail. The Bureau of Land Management has since cleaned this area up. With the absence of trees, mushers can see what seems like forever. 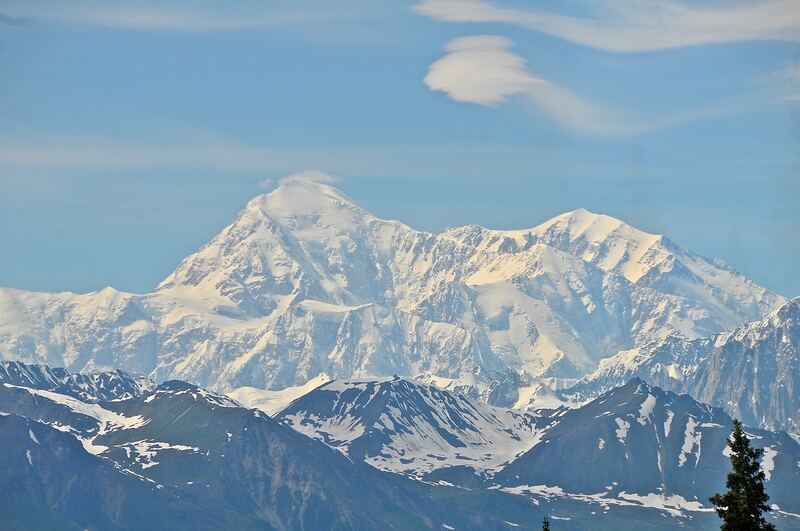 During the day mushers have the hope of seeing a magnificent view of Denali. After a very long straightaway, the trail will go in and out of the treeline until arriving at Sullivan Creek. There is a bridge here for mushers to use to cross the creek. Good thing, because usually the creek is open water and pretty deep. Section three of this part of the trail is Sullivan Creek to Nikolai, about 21 miles. The last 12 miles of this section is marked and maintained by the Nikolai villagers. This will be a quick run, flat and fast through the woods, swamps, and lakes. 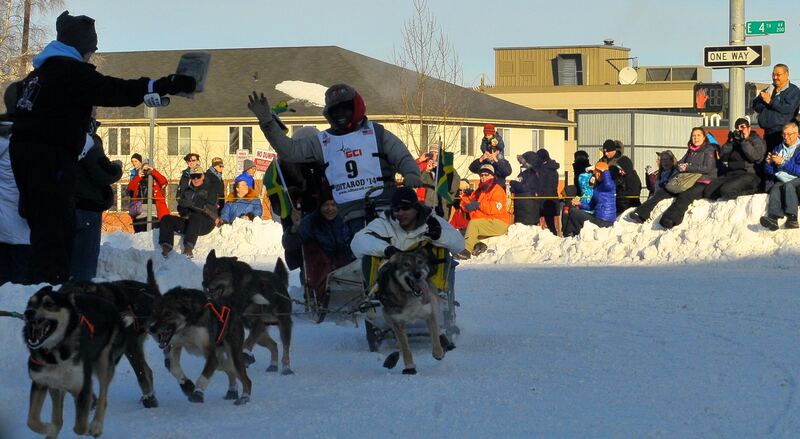 The mushers have made it to Nikolai. Most of the tough part of the trail is behind them, but they better not let their guard down, because anything can happen. 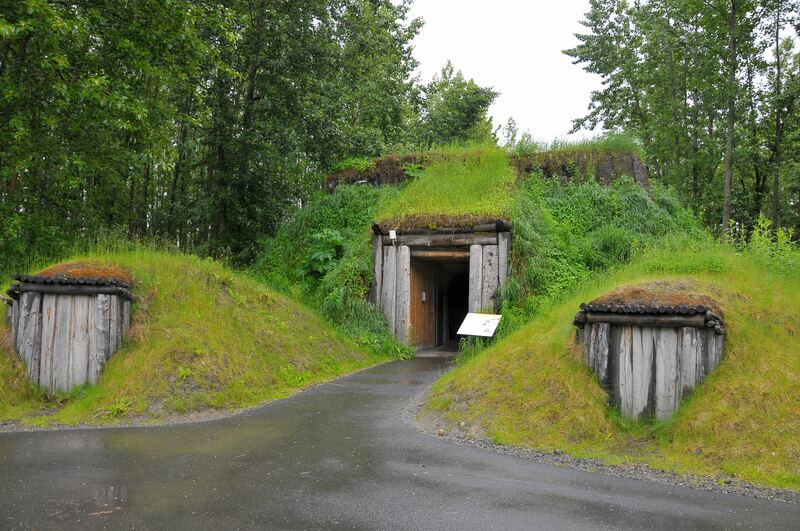 Nikolai is the first Native Alaskan Village along the trail. Nikolai is an Athabascan village that was settled during the Gold Rush. Originally, it was the site of a trading post and roadhouse that connected the Ophir Mining District to the Cook Inlet. Present day Nikolai has approximately 100 people living in the village. Traditionally Athabascan people have lived in the Interior along the Yukon, Tanana, Susitna, Copper, and Kuskokwim (Nikolai) rivers. Today they live throughout Alaska. Children in Nikolai are taught the many Athabascan Cultural Values. Athabascans are taught respect for all living things as well as village cooperation, respect for land, sharing, and respect for Elders. The first time I spoke with the students and teacher/principal at Nikolai it was their lunch time. Immediately I noticed cultural values being practiced. Sitting in the midst of the 12 students of the Top of the Kuskokwim school (Nikolai) were several Elders. The Elders frequently lunch with the students, a wonderful opportunity to share stories with young children at the school. 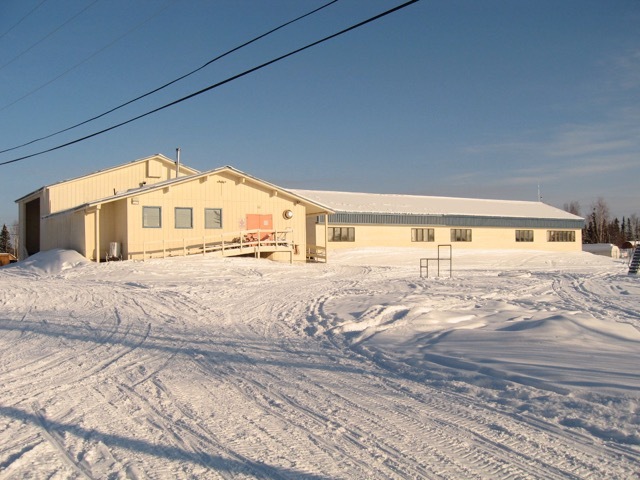 The Top of the Kuskokwim school is part of the Iditarod School District. There are about 200 students served in seven different communities. None of these schools are accessible by road. My students were amazed when they found out there were only 12 students in the entire school, kindergarten through 12th grade. Even though this is a small school, they have many opportunities. We met a student who was using his lunch time to engage in a virtual flight simulator. My students thought that was awesome. Students in grades 7-12 have the opportunity to take aviation classes. With limited access to roads, air travel is important. Studying for a future career at this young age is a perfect opportunity for students. 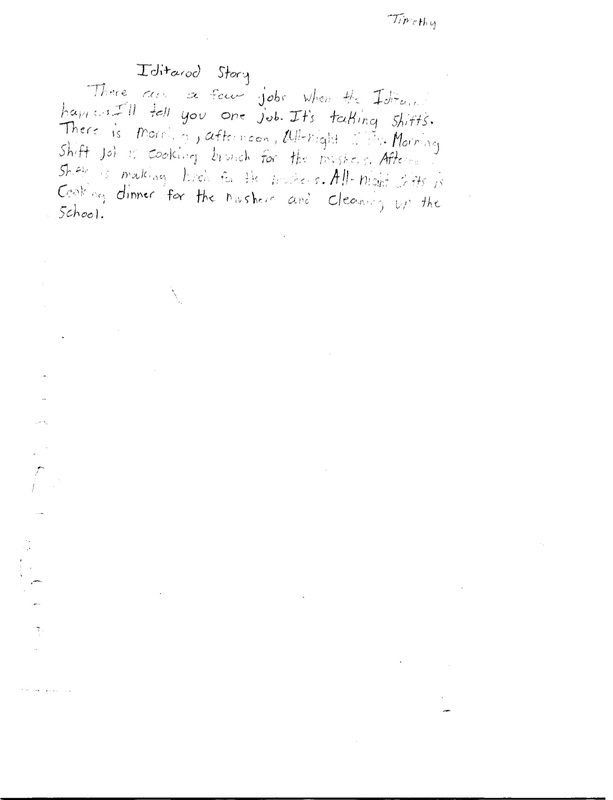 Timothy’s (from Nikolai) writing about working during the Iditarod. 1. Read through the list of Athabascan Values. My school has a list of values that we expect all students and staff to abide by: PRIDE (Perseverance, Respect, Integrity, Discipline, and Excellence). Examples of these values are holding doors open for others, walking down the correct side of the hall, acting appropriately at assemblies, turning in work, respecting all students and adults, getting to classes/practices on time, etc. Is there a set of values that your school follows? Choose one Athabascan Value and one of your school’s values. Compare and contrast the two values. 2. How do you think a student in Nikolai could display your value? How do you think you could display an Athabascan Value at your school? 3. How can your value be displayed by a musher running the Iditarod? 4. How can an Athabascan value be displayed by a musher running the Iditarod? 5. Draw a picture of portraying your value and a picture portraying the Athabascan value. To read more about the trail from Rohn to Nikolai read Sanka’s Virtual Trail Journey or Don Bower’s trail notes. Skype is an incredible tool teachers have at their fingertips allowing them to communicate with other classes and speakers around the world. Skype in the Classroom provides teachers with opportunities to share lessons, join lessons, and find guest speakers for their classrooms. A very popular Skype in the Classroom lesson is Mystery Skype. My class recently held a Mystery Skype with the village of Nikolai. 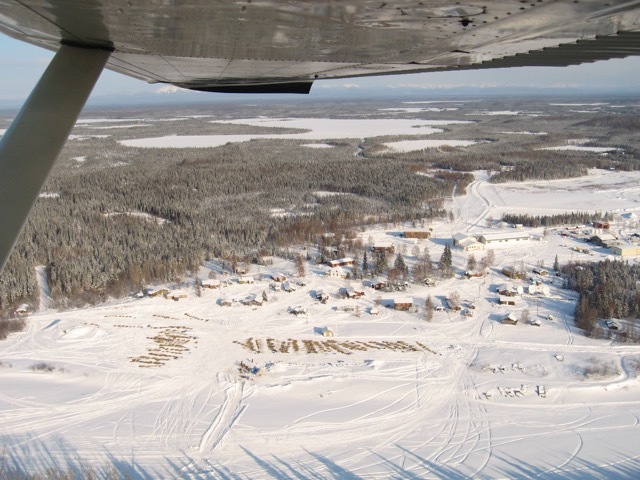 Nikolai is a small village along the Iditarod Trail. Tuesday (11/11/14) I will post a Checkpoint Checkup sharing information about Nikolai. The objective in a Mystery Skype is to ask yes or no questions about location to determine where the other class is located. The questions should be centered around geography (directions, latitude/longitude, equator, bodies of water, mountain ranges, etc). The classes take turns asking each other questions while trying to locate each other. A Mystery Skype does not necessarily have to be with another class. The reason we chose to do a Mystery Skype with Nikolai was to start a relationship with that class. My class will communicate and work with the Nikolai class over the next couple of weeks. This is a great way to start a relationship with another class as well as analyze the geography of their location. Jen Reiter, 2014 Iditarod Teacher on the Trail™, held a Mystery Skype with a friend and Iditarod volunteer in New York, live from Central Park in front of the Balto statue. Maybe you have a friend or family member living or vacationing in Alaska. Have this person work with your class on a Mystery Skype. Another idea is to contact the museum in Cleveland, Ohio, home of stuffed (preserved and mounted) Balto. The Cleveland Museum of Natural History offers a distance learning program called Balto: A History of Humans, Huskies, and Health in Alaska. This program teaches students about the disease diptheria and how instrumental Balto was in the famous Serum Run. Balto reminds us how important sled dogs were in the history of Alaska. Preserving the use of these great athletes is why Joe Redington started this amazing race, the Iditarod. Participating in the distance learning program also provides students the opportunity to try on authentic Iditarod gear. Any Mystery Skype can turn into an unlimited amount of future assignments and projects to do with the other class. 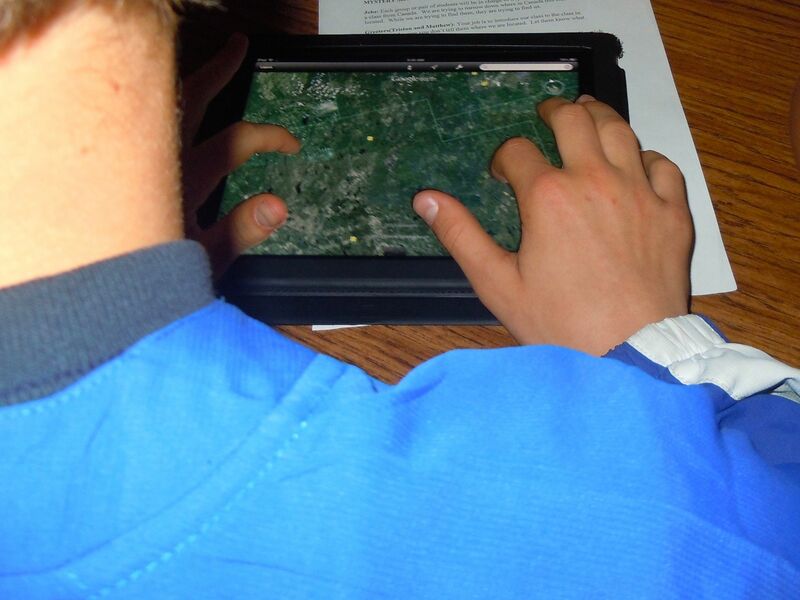 One of my students working with Google Earth trying to locate the other class. When my class participates in a Mystery Skype, students are assigned specific jobs to complete during the Skype session. Greeters: The greeter introduces the class to the other class. Make sure the greeter doesn’t tell them the location of your class. Do identify the grade and subject of your class. Q&A: This job is to ask the questions your class has for the other class. Q&A students will also answer any questions from the other class. Remember, questions must be yes or no. The Q&A person (or group) should be receiving new questions from the New Questions group as you are working. Recorder: The recorder keeps track of all the questions your class asks the other class and records the answers on the board. This helps the other students work and determine their next question. Videographer: This person takes video clips of your Skype session. Photographer: The photographer takes pictures of your class working during the Skype session. Google Earth: This job requires students to use Google Earth to narrow down the other class’ location. This group works with the New Questions group. Mappers: The mappers use the class Atlas to narrow down the other class’ location. They also work with the New Questions group, as well as with the Google Earth group. New Questions: This job requires students to work with the Google Earth and Mapper groups to create yes/no questions to ask the other class. Runners: The runner runs (walk fast) the next question to the Q&A group. Bloggers: The bloggers create a blog about the Mystery Skype with the other class. Our class’ blog will be posted to our Facebook and Twitter pages. Twitter: This group is in charge of creating live tweets during the session. They will use #mysteryskype in each tweet. When on Skype- look for Iditarod Teacher on the Trail™ to Skype with me and/or my class and/or contact me by email for additional information.